It all began when with a desire to support Australian jazz & improvised music. Kinetic Energy Theatre Company’s co-directors Graham Jones & Jepke Goudsmit have a long love affair with jazz. When they got together with their friend and trumpeter/composer Lee McIver, their shared mission took shape. The aim was to create an acoustic listening environment in which to present leading Australian contemporary jazz & improvising performers, and where new talent is nurtured; to provide a place for exploration and experimentation (‘create a concert you cannot perform anywhere else’…); to inject the scene with a vital impulse towards cross generational exchange; to stimulate inter-disciplinary development, and to support original contemporary Australian work. And so in 2010, Kinetic Jazz was launched and Sydney responded: the musicians took off, creativity flowed and bold explorations found fertile soil. Key ingredients being: authenticity and adventurousness, and the deep desire to bring together the maker and the listener within the art of listening. Kinetic Jazz's home base is right in the middle of the Inner West at the St Luke’s Church precinct in Enmore, whose hall is an acoustic paradise for live sound and music. Kinetic Jazz has come a long way to realise its aims. Many initiatives have taken off, such as the Drum Kitchen Project, the Poetry & Jazz connection, and numerous experimental duos & trios have been spawned. The Kinetic Cinema project was set up to show archival footage, and new work that links sound & the moving image. In January 2011, we formed the Kinetic Jazz Orchestra (KJO), an 18-piece composers big band. The KJO predominantly plays new work created by its own members. We also brought legendary big band composer Mike Gibbs to Australia, twice, to work with the KJO and mount a Gil Evans program as well as a selection of his own exquisite pieces. Australian composer Roger Dean has been a regular guest composer working with the KJO, and in 2013 Bruce Cale joined us to write new work specifically for the band. The KJO has become a force majeur in the music scene. Our major Festivals have been professionally recorded, with the best pieces featuring on our very own Kinetic Jazz CD series. 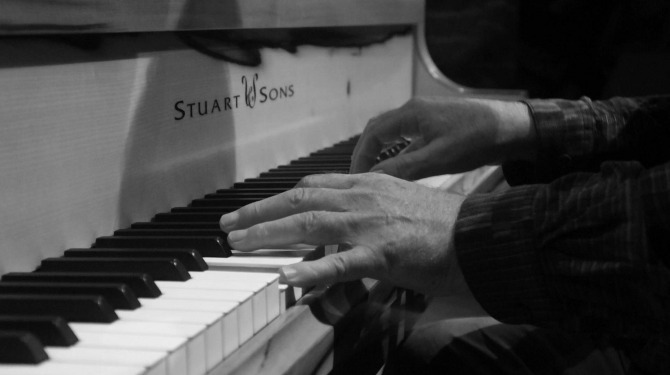 For five years our pianists have been able to enjoy the rare opportunity to explore the special range and scope of that magnificent Australian piano: the unique Stuart, thanks to the ongoing sponsorship by Stuart & Sons and Albert Music. International and interstate guests regularly feature in the program, such as flute master Kaoru Watanabe from New York, pianist Tony Gould from Melbourne, and saxophonist Remco Keijzer from Melbourne/ Amsterdam. In 2014, US guitarist Jeff Peterson was our guest, as well as international flute master Riley Lee. In the course of the 18 seasons that we've produced so far, we have brought an enormous range of artists in the contemporary jazz field together, and presented their work to an appreciative audience. This propels us into the next stage of the journey, venturing out to new ground, literally in terms of venues, and metaphorically in our musical explorations. In 2015, Kinetic Jazz will present one day gigs sprinkled throughout the year. With fresh projects, ongoing experiments, and exciting surprises. Guided by our ongoing focus on original composition and on listening, Kinetic Jazz continues to entertain, arouse, challenge, massage the soul, and send the spirit soaring. Our upcoming event is "TUNE IN". Please go to the EVENTS page for all details.